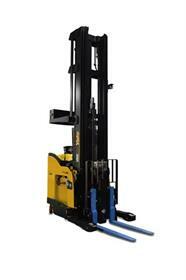 JBT is bringing a new dual-mode AGV to the market in cooperation with Hyster-Yale Materials Handling. The technology developer says the dual-mode truck signals a direct response to trends in warehousing, where automation is increasingly needed. The new truck operates in both automatic and manual modes and can reach up as high as 30 ft. (9 m) into double-deep storage, features that make it an ideal fit for distribution centres and other warehouses. JBT is powering Hyster-Yale’s Dual-Mode robotic reach truck by providing sensors and 3D cameras for precision, on-board navigation for automated performance, and fleet management software for optimised efficiency. The partners claim this is the first dual-mode AGV of its kind, and say the robotic reach truck will help companies address challenges presented by shrinking labour pools and e-commerce-driven inventory growth. "This collaboration with Hyster-Yale leverages the best of both sides of the relationship," explains Barry Douglas, vice president and general manager of JBT Automated Systems. "JBT provides the hardware that makes automation possible as well as fleet management software and systems-integration expertise. Meanwhile, Hyster-Yale mass-produces the vehicles and provides its renowned local service and support. Each partner plays to its strengths. In doing so, JBT believes that, collectively, we can more efficiently quench the thirst for automation in the marketplace and better support it. Perhaps most importantly, we can also help our customers solve their business challenges." JBT has been designing and manufacturing AGVs for over 30 years. Hyster-Yale’s collaboration with JBT augments it partnership with another AGV specialist, Balyo. In 2016, the forklift maker entered into a preferred vendor cooperation agreement with Balyo to market self-guided trucks in North America. Through the agreement, Hyster-Yale broadened its capabilities by offering robotic high-productivity solutions for the materials handling industry, while Balyo accelerated adoption of its robotic solutions.